3. Writing two or more academic and semi-academic articles on the place-based economic and cultural geographies of urban waste. of places like Bholakpur to represent the true value of their contributions to Hyderabad’s economy and ecology, while simultaneously identifying ways to reduce the risks they bear in managing the city’s waste. Over the course of the project, we built deep linkages with the community of scrap traders and workers through collaborative mapping workshops, focus group discussions and survey-based quantitative data collection. As each of these was done with an open-ended approach, the outputs far exceeded the original plan. For example, the mapping platform which went through an iterative process of design became available to a variety of communities and researchers interested in mapping biodiversity, public transit and environmental sanitation helping us to create databases that can be used for a range of community mobilization activities. The media, particularly newspapers, took an active interest in the project and published several articles on the politics of waste, the potential of mapping technologies, and popular geography (see, for example, here). A popular theatre group in the city worked with the residents of Bholakpur to produce an hour-long play; it can be watched online here. We faced challenges in the design of a collaborative multimedia and mapping platform, and still have not fully resolved the question of how best to build something open-ended. After several iterations, we settled somewhat uncomfortably on a MediaWiki platform because it allows us to generate content on the fly, giving the freedom to alter the taxonomies as we go; the alpha version is available here. As the interactive platform develops, we hope it will serve as a resource for both academic researchers and community organizers, able to submit, and put to work, geo-tagged images, audio recordings, and text to represent and challenge places of ‘value’ and risk in the city. Our relationship with Bholakpur communities transformed from one of wariness in the beginning to one of active engagement on the questions related to housing and safety and state-led planning processes. As we began the project, we knew that building enduring relationships of trust is a long-term process. 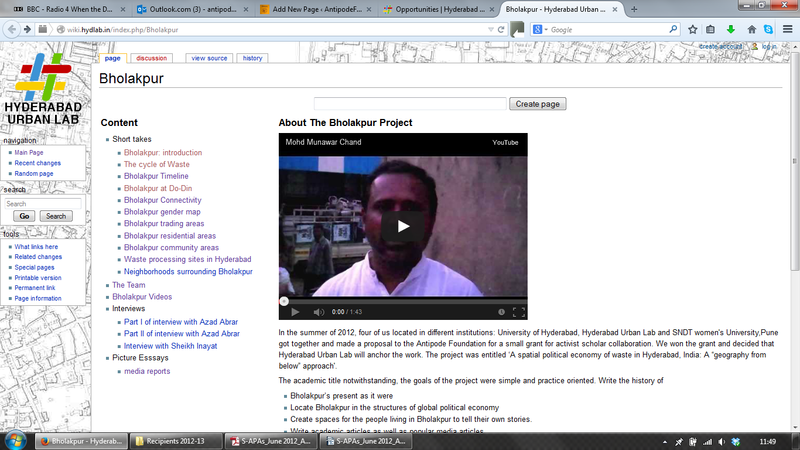 Why should the people of Bholakpur trust a group of academic researchers? We ran into people stonewalling us with “we don’t really expect you to do any good for us; we just want to be sure that you do not cause any damage…”. Indeed, the relationship between social scientists and communities was already structured through a particular idiom. As one of the traders, who in time became a strong supporter, said at first “I dont really understand this need to actually know the truth. You collect data, you write a paper and you get your certificate. 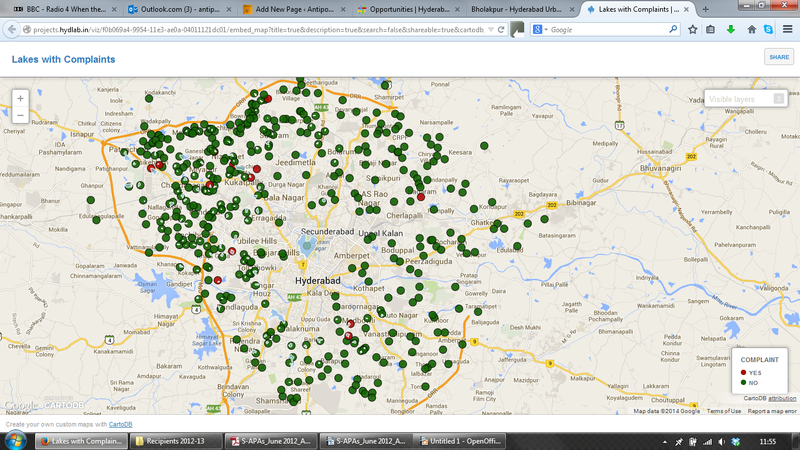 Why is it important to get the data to reflect the reality?”. Ten months into the project, the same person said to us “Now I understand what it means when you say, that this kind of work can actually bring us some good”. The project also facilitated an MPhil thesis (shortly due for submission by a student at the University of Hyderabad). Our Antipode Scholar-Activist Project Award provided critical support for a small initiative to take off and grow in multiple directions without losing sight of the modest goals with which it all began. The resources generated in the project are currently being developed in three directions: [i] a place-based critique of the spatial ontology of masterplanning approaches in India; [ii] a political-economic investigation into the circuits of waste; and [iii] a series of educational modules both for higher education programmes in law, planning and urban studies, and for ‘Right to the City’ activists.